During the late 1940s and early 1950s, several different programs brought Hollywood stars to radio to reprise their performances from popular films. However, Screen Director’s Assignment brought something to this format that no other show had: the directors. The director of a motion picture would open each broadcast by introducing the radio adaptation of their movie, and would talk with the stars at the end of the program. Imagine listening to "It’s a Wonderful Life" and then hearing Jimmy Stewart and Frank Capra share their thoughts on the making this classic film. 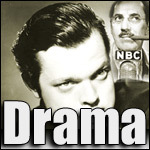 In addition to Capra, directors like Alfred Hitchcock and John Ford were heard on this series. This star-studded extravaganza brought John Wayne, Bette Davis, Carry Grant, Edward G. Robinson and many more Hollywood greats to radio, and featured such memorable movies as Spellbound, Miracle on 34th Street, Fort Apache, All My Sons, and Jezebel.